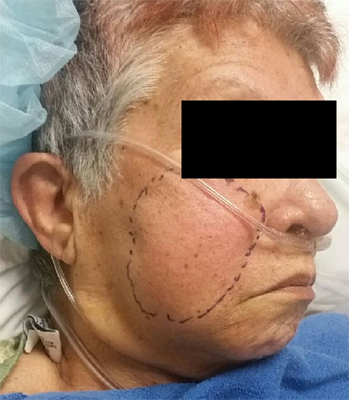 Case Description: 84 year old female with past medical history of trigeminal neuralgia, atrial fibrillation, hypertension, GERD, osteoarthritis, vertigo, anemia, depression, seizures, dyslipidemia, thyroid disorder, presents to the ED complaining of Right sided facial pain. The patient reports that she follows up with a chronic pain management physician who recommended conservative management of her trigeminal neuralgia using Carbamazepine, Antidepressants, and Neurontin. The patient reports 4 months ago the pain developed after a fall and that medical management has, thus far, provided no improvement. The patient was on Clopidogrel, which was stopped 5 days prior to the block. The patient then underwent a classical approach fluoroscopy guided trigeminal ganglion nerve block as a trial for diagnosis and possible future radiofrequency ablation. The procedure proceeded without any evidence of complication, where local anesthetic was injected into the foramen ovale with negative aspiration. In the post-operative period, the patient was noted to have ipsilateral swelling of the cheek, which appeared to be expanding. The swelling was well demarcated and an outline was drawn around it to monitor for expansion. The patient had a benign physical exam with no pain and no neurological symptoms. The hematoma did not expand beyond the demarcated borders and the decision was made to apply pressure and monitor. The hematoma did not worsen and the patient reported her previous trigeminal neuralgia pain was alleviated. The decision was made to perform a trigeminal ganglion radiofrequency ablation for long term alleviation of the pain. The patient underwent the RFA on POD3 with no issues. The patient was subsequently discharged with decreasing size of hematoma, and will follow up as an outpatient in 1-2 weeks. Discussion: The trigeminal ganglion is located intracranial and measures 1x2cm. In its intracranial location, it lies lateral to the Internal Carotid Artery and cavernous sinus, and is slightly posterior and superior to the foramen ovale. The foramen ovale is the path by which the mandibular branch of the trigeminal nerve leaves the cranium. Inside the foramen ovale, is the accessory meningeal artery, which could be punctured during trigeminal nerve block. The accessory meningeal artery is a branch that arises from the extracranial segment of middle meningeal artery prior to entry into the foramen spinosum. This complication is relatively benign, as the hematoma will self-tamponade as it expands. Due to proximity, it is more likely that the hematoma source was the accessory meningeal artery than the internal carotid artery. Interestingly, the patient discontinued clopidogrel for 5 days prior to the block. NYSORA anticoagulation guidelines recommend discontinuing clopidogrel 5-7 days prior to intervention. It is difficult to determine if waiting 2 days more for the maximum 7 days of discontinuation of anticoagulation would have changed the outcome.